United said it would use the additional £27 to subsidize its own supporters traveling to Spain for the second leg as it did for games against Valencia in the group stage, and against Sevilla last season. United has been given 4,160 tickets for the tie. 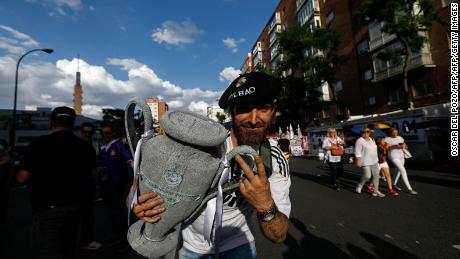 A spokesman for Barcelona told CNN that ticket prices for the United game had not been increased and that the price would have been the same for any opponent in the quarterfinal. The spokesman added that at no point did United ask for ticket prices to be reduced. He also underlined the club’s low season ticket prices, which includes Champions League games. Many clubs make fans pay for Champions League games on top of their regular season tickets. As of Friday April 12, there were still tickets being sold on Barcelona’s official site with the cheapest priced at €159 ($180). The most expensive ticket available was set at €3,290 ($3,723) which includes access to the premium lounge and catering, according to the description on the website. Duncan Drasdo, chief executive of Manchester United Fans Trust, wants to see a cap on ticket prices for away fans in European competition, similar to the £30 limit imposed upon clubs by the English Premier League. “The cap works pretty well in the Premier League, as long as ticket allocations are defended,” Drasdo told CNN. “The Premier League has recognized that as an away fan you are not a customer of the home club and so you’re ripe for exploitation. Drasdo, who is traveling to Barcelona with his two children, was also critical of airlines who he says increase their prices minutes after the draw has taken place. It means that plenty of fans, like Drasdo, often have to take longer routes to reach their destination. On this occasion, he is traveling from Manchester to Liverpool airport, then flying to the island of Ibiza, staying overnight, and then flying to Barcelona the next morning. For the return journey, he will fly from Barcelona to Nantes in France, and then on to Manchester. Even with indirect flights, Drasdo says he spends on average around £450 ($588) per European away game, meaning that this season alone he would have coughed up approximately £2,250 ($2,942) on five matches. Hundreds of other fans are also expected to take indirect flights in order to save money. 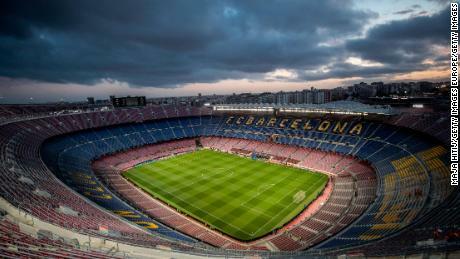 Aoife Turner, a Manchester United season-ticket holder, told CNN she found flight prices to Barcelona had increased just minutes after the quarterfinal draw had taken place. She is flying from Manchester to Madrid and then on to Barcelona before her return journey takes her from Barcelona via Dusseldorf in Germany before heading to Manchester. She also says that many of her friends are taking similarly elongated routes. “As a fan that spends thousands and thousands of pounds a year not only on my season ticket but on flights, hotels, food and drink and the rest of it, I think some of these prices are mad. “Granted, this is my choice to follow United but I feel by charging the prices they do that it’s taking the sport even further away from the working class when they’re having to fork out a £100 before they’ve even got there. The row between United and Barcelona occurred amid rising criticism of ticket prices in European competition. Last month, supporters of Liverpool and Bayern Munich cast rivalry aside to protest against the rising cost of ticket prices. Bayern’s supporters unfurled a banner early in the second half of the goalless draw that read: “Away ticket LFC 48£ FCB 55€”. The gesture was applauded around Anfield by Liverpool supporters. 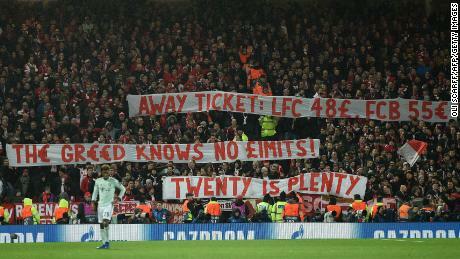 The “Twenty is plenty” refers to the campaign launched in England by the Football Supporters’ Federation for clubs to cap ticket prices for visiting supporters at £20. In February, the English Premier League announced that its clubs would continue to cap away tickets at £30 for another three seasons after introducing the plan for the start of the 2016-2017 campaign. 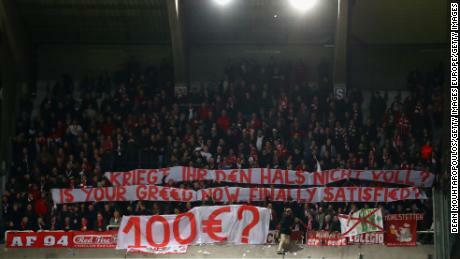 This is not the first time Bayern’s fans have protested against the cost of ticket prices. In 2017, Bayern supporters threw fake money onto the field of play during the Champions League victory at Belgian side Anderlecht after being charged €100 to watch the tie. In response, Anderlecht was ordered to partially refund Bayern supporters after the competition’s governing body UEFA ruled ticket prices were excessive. Bayern was fined by UEFA for the protest. In December 2018, Greek team AEK Athens was ordered to reimburse Bayern Munich fans after being found guilty of violating ticket prices for a Champions League game. A working group was set up last year by the European Club Association and UEFA following complaints from clubs over ticket prices. Speaking in December, Uefa president Alexander Ceferin suggested that ticket prices should be capped in order to help match-going fans. “We know about the problem,” Ceferin told reporters. “It would be good to do something to cap prices. “It’s absolutely not correct that that away fans are being charged five times more than the local ones. “The clubs are using tricks to go around the regulations, so maybe the solution is to say what is the highest prices that can be charged to away fans. Previous articleBarcelona vs Manchester United: How much would you pay to watch Lionel Messi?